The Bitcoin.com Wallet is a simple cryptocurrency light client that supports bitcoin cash (BCH) and bitcoin core (BTC). Since the initial release of the software, there have been 3.7 million noncustodial wallets created and climbing. Now, the latest version of the Bitcoin.com Wallet not only allows users to manage digital assets, but also provides the ability to switch between the BTC and BCH. Ever since the Bitcoin.com Wallet was introduced in August 2017, thousands of wallets have been created each week with minimal effort. The wallet is an easy to use light client that provides the ability to store, send and receive BCH and BTC. The wallet is also noncustodial, which means the user is 100 percent in charge of funds at all times. Since the launch of the Bitcoin.com Wallet, there’s been over 3,732,010 wallets created. The hard working developers behind the wallet software have now released version 5.6, which allows users to purchase digital currencies and swap between BCH and BTC using Sideshift. 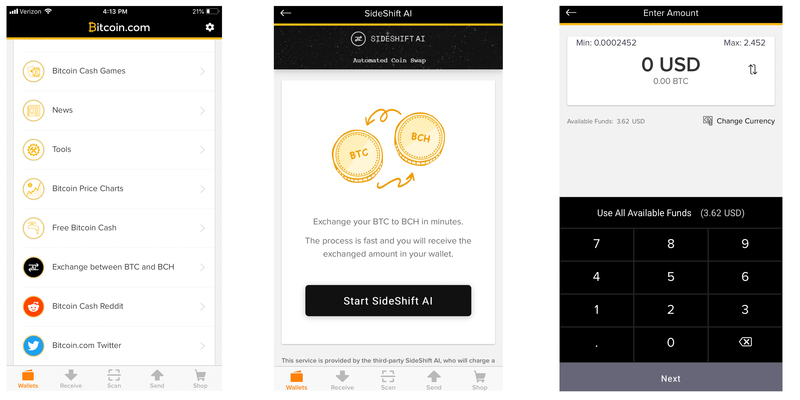 To utilize the Sideshift application on the Bitcoin.com Wallet homepage, simply scroll down to the tab that says “Exchange between BTC and BCH.” From there, you’ll be directed to the Sideshift application which works within the wallet interface. Press “Start Sideshift AI” to proceed with swapping BTC for BCH or vice versa. After the start button is selected, you to choose a wallet with funds to send from in order to conduct the trade. After picking a wallet with funds and then choosing a wallet to send to (the receiving address), the user then selects how much they want to trade. The Sideshift application allows you to choose “All available funds” as well. After choosing the amount of funds to swap, the user is shown how much Sideshift will charge for the trade and the BCH network fee deduction too. You’ll then be asked to press the “OK” tab, which gives consent to the swap and network processing fees and slide the send bar to finalize the shift. Using the shifting feature takes just a couple of minutes and the Sideshift fee is very competitive compared to the majority of shifting platforms. 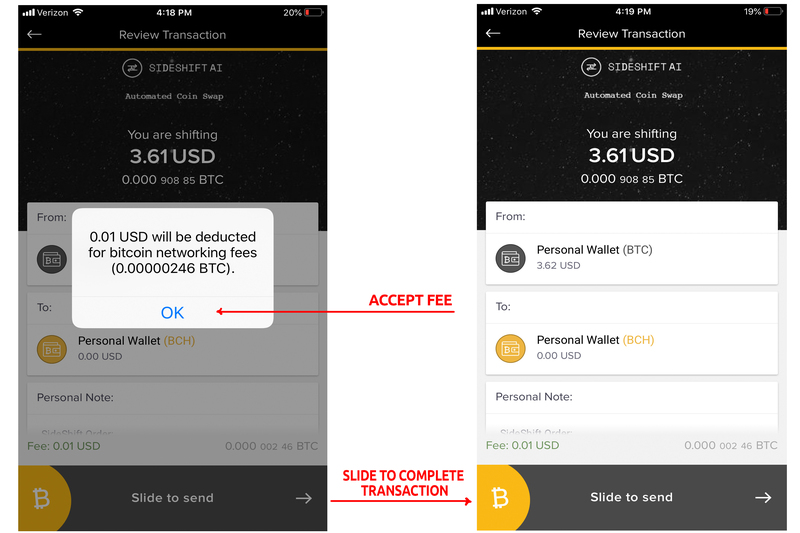 In addition to the Sideshift feature, the Bitcoin.com Wallet has upgraded the buy feature which gives the ability to purchase bitcoin cash (BCH) and bitcoin core (BTC) instantly. 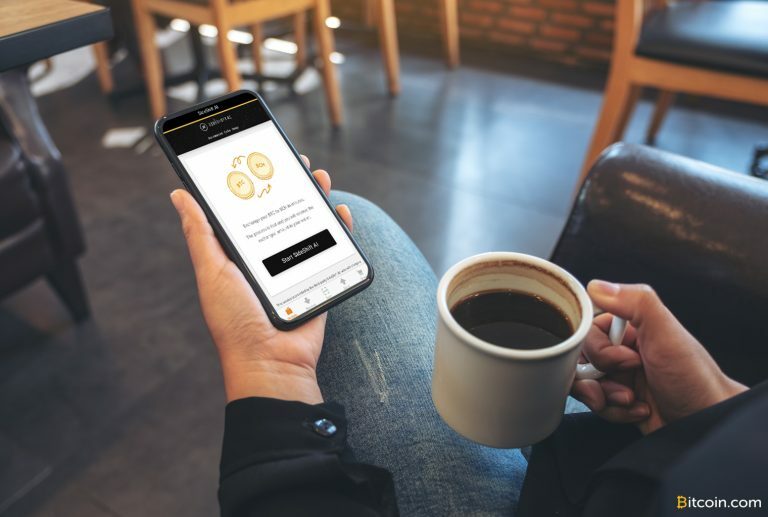 The new features added to the Bitcoin.com Wallet make the powerful and secure cryptocurrency wallet even more robust than ever. The wallet also includes useful links to our newsdesk, blockchain tools, bitcoin cash games, and charts. Not only does the Bitcoin.com Wallet offer a single owner wallet, but the software allows for multi-signature wallet creation as well. Moreover, the software utilizes multiple languages including English, Spanish, French, Italian, Polish, German, Japanese, Chinese, Russian, and Portuguese. Allowing users to easily purchase cryptocurrencies and swap their BTC for BCH helps promote accessibility and adoption and at Bitcoin.com that’s always been our mission. Do you use our wallet? Let us know what you think about the Bitcoin.com Wallet in the comments below. Image credits: Shutterstock and Bitcoin.com. Not up to date on the news? Listen to This Week in Bitcoin, a podcast updated each Friday. The post Switch Between BCH and BTC Effortlessly With the Bitcoin.com Wallet appeared first on Bitcoin News.